Sorta miss not hooking something heart related this month but still have Lititz Hens and an anxiously awaiting rug to be bound. So maybe next year. Meanwhile, I do have a Valentine theme on the harvest table. The rug is Olde Hearts, a design sold by Woolley Fox, and I did the border differently than drawn. Fell in love with the way Barb Carroll hooked hers so wanted to follow in my mentor's footsteps. When at Barb's she color planned the border with wool she used. In the basket to the far right is a hand torn heart hooked by Lauren (Rugs and Pugs). She also hooked the smaller blue heart, both of which I was a lucky recipient during a giveaway. Lauren's hooking is wonderful and the person who won this year's giveaway is very lucky indeed. The other hearts were hooked by moi. Finally after almost a full week of intestinal disturbance am feeling almost human again. I was beginning to worry because despite my hydrating, eating bland and boring meals the trouble persisted several times during each day. So even tho the sun isn't shining outside my attitude is feeling brighter and sunny. So glad you are feeling better! I like the border on the heart rug. I do love the border on that rug. I should make some hooked hearts, I do have some that Kelley made me. Love your rug and the table setting. Glad ur feeling better!! Great news! I have a scrapoy heart mat out now,,, love hearts anytime of year! 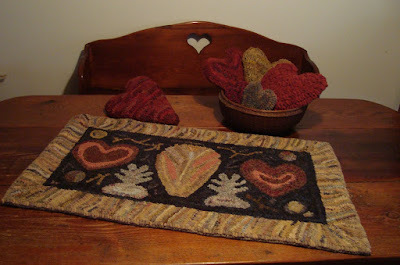 Love your heart rug & little hearts !!! Feel better so you can enjoy pulling loops !! !